Main Street Gazette: Where do you think you are? Disney World? This week, I once again had the esteem pleasure of spending some time chatting with Lou Mongello for the WDW Radio Show. As we always do when we jump aboard the Wayback Machine, we had a tremendous amount of fun discussing the development, history, and potential future of Epcot’s Wonders of Life pavilion. Be sure to check out Episode 227 to hear all of our informative antics! In preparation for the show, I spent a lot of time pouring through documents, videos and publications, but this singular image caught my eye and I thought I would share it with you. 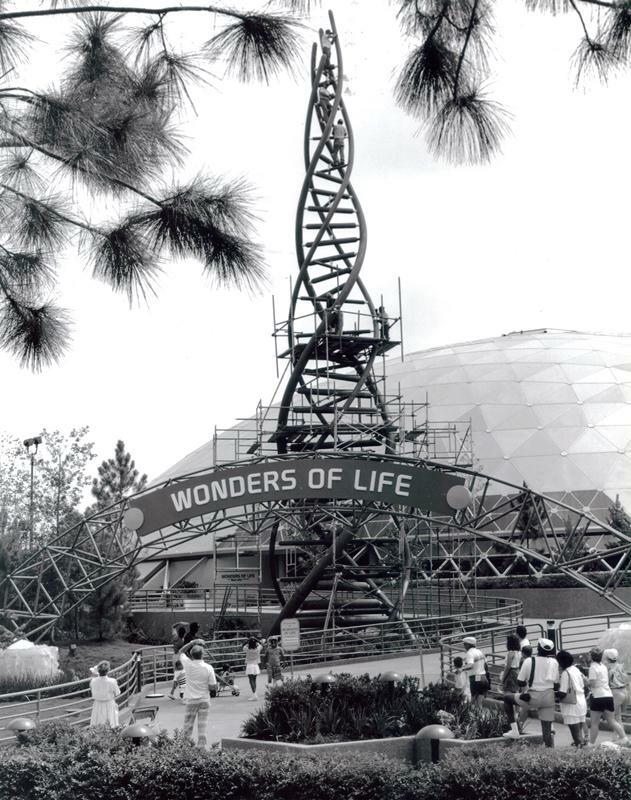 What we have here is the construction (notice the FUTURE SITE OF WONDERS OF LIFE sign in front of the pavilion) of the Tower of Life, modeled after the DNA double helix. 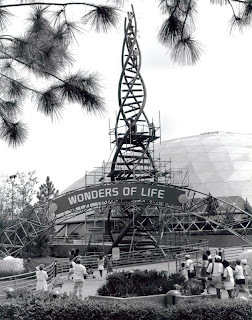 This work of art, paired with the gleaming gold dome of the Wonders of Life, were beacons to pull guests towards the pavilion, baiting them to venture up the hill to see what the futuristic circus tent had in store. Built to withstand 95 mph winds that occur in Florida, the construction of the 76 foot tall structure so compelled the Imagineers that this same image was used as the cover on the inaugural issue of their publication, WDEye.